Our country is surrounded by the deep blue Atlantic Ocean on one side the Caribbean Sea on the other. Small Island Developing States (SIDS) such as ours are particularly vulnerable to natural disasters. Global climate change is expected to increase natural disasters, such as hurricanes, floods and drought. In addition, to climate change, population growth and urban development are increasing the vulnerability of SIDS to natural disasters, particularly in urban and coastal areas. Country Sint Maarten has seen and experienced in the past damages caused by storm systems and inclement weather to those aforementioned areas. At the end of January it was announced in a discussion at the Dutch Second Chamber of Parliament that Curacao and Sint Maarten have not yet formally indicated whether they want to participate in the Kingdom Law proposal to ratify the 2015 Paris Climate Accord. Aruba has responded that it would like to be a part of the Kingdom Law. Climate Change is a Kingdom issue and should be addressed at that level, and Sint Maarten should be at the forefront in making sure that it receives the desired and serious attention it deserves. The topic of climate change was also a discussion point at the recently concluded 15th Overseas Countries and Territories-European Union (OCT-EU) conference in Aruba which was attended by Sint Maarten’s Prime Minister William Marlin. The effects of global climate change continue on a daily basis. Each year the global community of nations are informed throughout the year about the impact human activities are having on our world. One of the most recent developments is at the North Pole which saw for the month of January sea ice volume melting to a record low, according to the United Nations World Meteorological Agency (WMO). Sea ice extent was the lowest on the 38-year-old satellite record for the month of January, both at the Arctic and Antarctic, according to data cited WMO from both the US National Snow and Ice Data Center (NSIDC) and Germany’s Sea ice Portal operated by the Alfred-Wegener-Institut. “The recovery period for Arctic sea ice is normally in the winter, when it gains both in volume and extent. The recovery this winter has been fragile, at best, and there were some days in January when temperatures were actually above melting point,” said recently David Carlson, Director of the World Climate Research Programme. In addition, the ice levels at the Antarctic are also at record lows, even thinner than expected for the summer season there. The Paris Climate Change Agreement would be beneficial for country Sint Maarten with possible access to the Green Climate Fund, which is a mechanism established to assist SIDS and other countries in adapting to and mitigating the effects of climate change. Sint Maarten needs a “Climate Change Adapt-Mitigate” Plan of Action as our own very survival as a country depends on it. Investments made in time will allow us to mitigate the changes for generations to continue to develop a vibrant and prosperous country for decades to come. Let’s work towards preparing our country’s readiness and resilience in a time of climate change. The European Commission announces its 3rd Global Event ‘Innovative and effective approaches to climate change adaptation and other post COP21 agreement priorities’, to be held, on 12-13-14 September 2016 in Brussels, Belgium. The Agenda 2030 with the SDGs and the COP21 Paris Agreement on climate change provide a new strategic framework for international cooperation. Consequently, the GCCA+ plans to contribute strategically, financially and technically, over the period 2016-2020, to the efforts of LDCs and SIDS parties to address these challenges. A year after the launch of the GCCA+, and as experiences from the GCCA, other programmes and the recent COP21 Paris Agreement accumulate across the globe, it is important that the GCCA+ ensures that lesson learning is an integral part of the development process and that knowledge generated from its implementation is shared across countries and regions and with key stakeholders and development partners. The GCCA+ Global Learning Event will explore how experience on the ground influences policy development and vice-versa on local, national and international scales. The aim of the GCCA+ GLE2016 will be to share past GCCA and current GCCA+ best practices and challenges to scaling-up and increasing impacts amongst beneficiaries and potential donors;to present recent and updated climate strategies and examples across various development sectors and actors such as on INDCs, NAPs, engagement with new stakeholders, new tools and approaches and to extract conclusions for the GCCA+. How could the INDCs be effectively linked to the other climate change policy processes (e.g., NAPA, NAPs, National Communications)? How to increase the social benefits of climate change policies and interventions (e.g. Number of beneficiaries, dissemination of best practices, etc.)? Linking gender, poverty and climate change mainstreaming – challenges and opportunities. Risk management solutions and tools (climate models, risk assessments, insurance schemes, adapted technologies, etc.) as a response to the adverse effects of climate change. European Delegation representatives, implementing partners, governmental bodies, non-state actors from academia, NGOs and the private sector working in the GCCA+ targeted countries with direct applied knowledge are all invited to submit proposals strictly focusing on these four topics and reporting practical experiences or studies showing the path towards a successful implementation of the Paris Agreement on these matters in Less Developed Countries (LDCs) and Small Island Developing States (SIDS). The submissions can be presented in multiples forms and media such as papers, posters, presentations, videos, etc. All submissions should include the following information as a common basis for selection: Clear title; Geographical scope (regional, national, sub-national); Sector(s); Stakeholder(s) involved; Result(s); Lesson(s) learnt. Submissions will be judged on the following criteria: (1.) relevance to one or more of the four topics; (2.) contribution to the implementation of the Paris Agreement; (3.) potential for duplication, scaling up and impact, and (4.) innovative power of idea, relevance of area, and potential for impact. Accepted submissions will be presented at one of the thematic sessions on day 1 and day 2 or during the open space session of day 3 (1/2 day). These submissions as well as others of value to the GCCA+ and that would not have been presented will also feature in the GLE2016 publication. Deadline for the submission of revised paper/poster/presentation/video/etcS. : 31st August 2016. Jamaica’s Minister without Portfolio in the Ministry of Economic Growth and Job Creation, Hon. Daryl Vaz, has described climate change as a “real and present danger” that will persist, and “critical and urgent action” must be taken by nations globally to reduce its effects. With the firm resolution to strengthen the Caribbean Community (CARICOM) to provide greater benefits for its peoples, the Hon. Dean Barrow, Prime Minister of Belize assumes the six-month chairmanship of the Community from 1 January 2016. He succeeds the Rt. Hon. Freundel Stuart, Prime Minister of Barbados. In a message to usher in the New Year, Prime Minister Barrow pointed out that there was a lot to be proud of and a lot to look forward to. Our resolution is to continue to strengthen our integration movement to deliver ever-increasing benefits to the people of our Community. We will continue our quest to improve our standard of living through providing a safe, viable and prosperous Caribbean Community. In so doing we will build on our successes and will be moving forward with a number of initiatives to achieve that aim,” he said. Making a commitment to build on past successes and to become more efficient in the face of the “sternest economic test that Member States have had to face in recent memory,” the incoming-Chair looked forward to increasing the pace both of the CARICOM Reform process and the implementation of the Community Strategic Plan 2015-2019. The Plan, which is designed to build CARICOM’s economic, environmental, social and technological resilience, has the CARICOM Single Market and Economy (CSME) as an important vehicle in that drive for greater resilience. Therefore, Prime Minister Barrow signalled CARICOM’s commitment to vigorously pursue the consolidation of the Single Market. A significant element of his resolution as the New Year dawns is encouraging more Member States to join the Belize, Barbados, Dominica, and Guyana in making the Caribbean Court of Justice their final court. In my view, another relevant factor in the lives of our people is the Caribbean Court of Justice (CCJ). The creation of our own jurisprudence will help define us as a people, and the excellent, well-reasoned judgements which have been the hallmark of the CCJ are ample proof of the intellectual quality of the legal minds of this Community. During my stewardship of the Community, I look forward to more Member States joining the four of us in the Appellate Jurisdiction of the CCJ,” Prime Minister Barrow said. He emphasised the strength in unity in achieving CARICOM’s plans, exemplifying the manner in which it rallied to attain the objectives of the three major international conferences in the past year, most recently at COP 21 in Paris. “The binding decisions taken on Financing for Development, the 2030 Development Goals and Climate Change have great potential to boost our growth and development and bolster our resilience. It is therefore in our interest to use our coordinated foreign policy to advocate at every opportunity for urgent implementation of those decisions. In so doing we will be seeking the support of our International Development Partners as well as other Small Island and Low-lying Coastal Developing States (SIDS),” the Incoming-Chairman stated. “I assume the chairmanship of our Community, following the incisive and decisive leadership of the Prime Minister of Barbados, the Rt. Honourable Freundel Stuart. His guidance during the past six months has been highly appreciated by his colleague Heads of Government,” he added. CARICOM Secretary General Ambassador Irwin LaRocque and Dr James Fletcher, who led CARICOM negotiators, in discussion with regional heads of government, ministers and negotiators at the Paris Climate Talks. 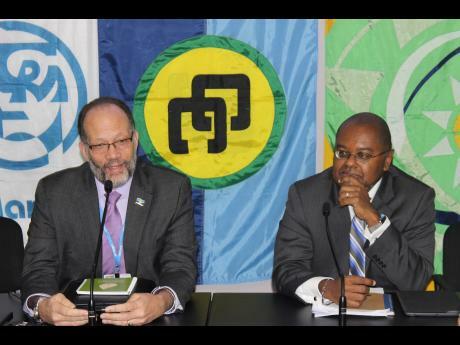 The ‘1.5 to Stay Alive’ campaign – run primarily in the lead-up to and during the recent international climate talks in Paris – has been given praise by Caribbean Community (CARICOM) chairman Freundel Stuart. “CARICOM’s interests were strongly represented in a focused and coordinated manner by heads of government, ministers, the CARICOM secretary-general (Irwin LaRocque)and his staff, and a team of experienced and skilled negotiators led by Dr the Honourable James Fletcher. We are satisfied that our strong advocacy helped to ensure that the [final] agreement reflected the region’s position on our major red-line issues,” Stuart, who is also prime minister of Barbados, said in a release issued by the CARICOM Secretariat through Panos Caribbean. “The region’s successful campaign, built around the slogan ‘1.5 to Stay Alive’, received energetic support from several groups and organisations, including youth and cultural artistes, whose efforts must be applauded,” added Stuart. The campaign kicked off in October with a launch event held in St Lucia. At the same time, a website, Facebook page, and Twitter account were established to promote Caribbean negotiating positions and to expose the region’s climate challenges. Later, a theme song – the collaborative effort of a number of regional acts – was released. Several other activities, including a Selfie Video Challenge and a flash mob, were also implemented to get Caribbean people in the know and behind the campaign effort. At the talks, the region, for the first time, had a pavilion – called the Wider Caribbean Pavilion – that afforded the space for strategy meetings by regional negotiators and networking among players. Caribbean artistes Aaron Silk of Jamaica and Adrian ‘The Doc’ Martinez of Belize were also on hand to spread, through music, the ‘1.5 To Stay Alive’ message, and were big hits with participants. In the end, Stuart said it all paid off. “We believe that the actions and investment approved in the agreement will bring us closer to the goal of maintaining global average temperature rise well below two degrees Celsius and along a clear trajectory downwards towards 1.5 degrees above pre-industrial levels,” he said. “That agreement will also help to realise the goals of lower greenhouse gas emissions, greater resilience, and sustainable development, especially among the small-island and low-lying coastal developing states (SIDS), with the most vulnerable populations such as the countries of the Caribbean. We determinedly and successfully promoted recognition of the special circumstances and vulnerabilities of SIDS, which are among the lowest contributors to greenhouse gas emissions, but are the most threatened by climate change,” Stuart added. One Jamaican actor involved in the negotiations agreed that the Caribbean could feel satisfied with the result. “The CARICOM region can be satisfied with the outcome, which retains the recognition under the (United Nations Framework) Convention (on Climate Change), of the fact that SIDS have specific needs and face special circumstances which render our territories particularly vulnerable to the adverse impacts of climate change. We have also secured a decision for equal funding for adaptation and mitigation,” noted Colonel Oral Khan, a member of the Jamaica delegation to Paris and chief technical director in the Ministry of Water, Land, Environment, and Climate Change. “This is very significant for us as the science is telling us that the concentration of greenhouse gases is already at a level that can be catastrophic. We, therefore, cannot await the benefits from current mitigation efforts, which will be realised over the next half a century. There are things we must do now to protect vital sectors of our economy and the lives of our people,” he added. What remains is to have these things actioned. “The international community must now retain the energising and uplifting spirit of Paris in the process going forward. The world expects no less,” Stuart said. Guyana signed a readiness grant agreement with the Green Climate Fund (GCF) at the 21st Conference of the Parties (COP) in Paris on Tuesday, December 08, 2015. The funding will provide USD 300,000 to Guyana to help the country build capacity to access GCF funding for its priority projects in the future. This project, which was negotiated between the Caribbean Community Climate Change Centre (CCCCC or 5C) and the Ministry for the Environment, Land and Sea of Italy, aims to address several issues affecting CARICOM States under the rubric of Climate Change, inclusive of mitigation, adaptation and vulnerability. The 5Cs is an Accredited Entity (AE) to the Fund, meaning that it can partner with GCF in delivering mitigation and adaptation projects on the ground in the Caribbean. Executive Director of the 5Cs, Dr. Kenrick Leslie attended the ceremony along with H.E. Raphael Trotman, Minister of Governance of the Department of Natural Resources and Environment, who signed on behalf of Guyana in the presence of H.E. 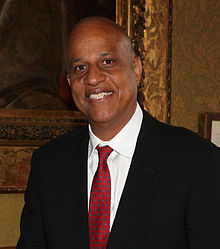 Winston Jordan, the Guyanese Minister of Finance. Ousseynou Nakoulima, Director of Country Programming, signed on behalf of the Fund. 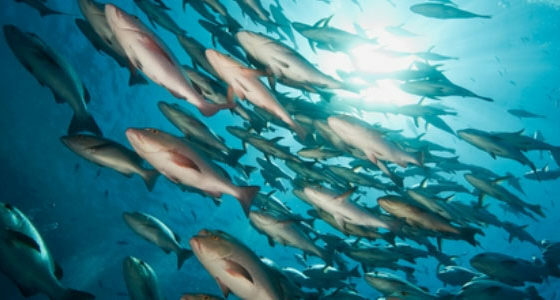 The GCF aims to help CARICOM Member States to adapt to climate change, by lessening their vulnerability to sea level rise and climate variability; identifying and implementing the Intended Nationally Determined Contributions (INDCs); reporting and assessing of the Member States INDCs and the development and dissemination of renewable energy sources and technology. The GCF also seeks to transfer scientific and technical knowledge, experiences and technology, facilitate the exchange of experts, scientists and researchers; enhance the capacities for the implementation of mechanisms under the United Nations Framework Convention on Climate Change (UNFCCC) and its related instruments, and to promote joint ventures between the private sectors of the Parties. The Fund provides early support for readiness and preparatory activities to enhance country ownership and access through its country readiness programme. A minimum of 50 per cent of readiness support is targeted at Small Island Developing States (SIDS) such as Guyana, Least Developed Countries (LDCs), and African States. More than 95 countries have so far expressed interest in receiving readiness support from the Fund, and more than 30 such grants have been approved to date. The estimated timeframe for the project is five years. Minister Trotman thanked the Government and People of Italy for their continued support and friendship shown towards the people of Guyana and the Caribbean. 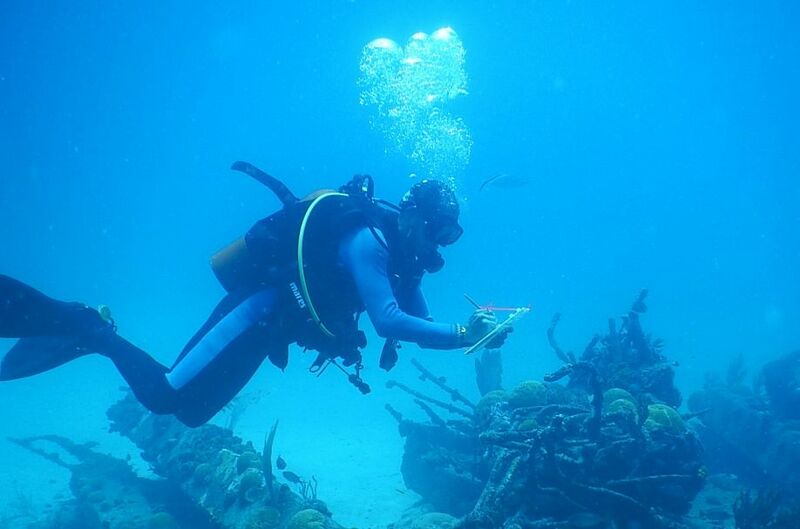 The Caribbean region is enduring the brunt of the ravaging effects of climate change. Sea level rise, frequent and intense natural hazards; extended dry seasons, loss of livelihood and the very disappearance of some of our islands are among the clear and present dangers that we face. The economic costs of climate change are beyond the capacity of these countries to bear without the provision of considerably more concessionary resources to address the impacts. This is why it is so important that our global partners support the call to limit warming to below 1.5C. This is achievable. This is urgent. Our very survival depends on it. This video was produced by the Caribbean Development Bank (CDB). The CDB is a regional financial institution which was established by an Agreement signed on October 18, 1969, in Kingston, Jamaica, and entered into force on January 26, 1970. The Bank came into existence for the purpose of contributing to the harmonious economic growth and development of the member countries in the Caribbean and promoting economic cooperation and integration among them, having special and urgent regard to the needs of the less developed members of the region. In September, the United Nations will finalise a Post-2015 Development Agenda known as the Sustainable Development Goals (SDGs). The SDGs follow and expand on the Millennium Development Goals (MDGs) which expire at the end of the year and will be “the global community’s plan of action” for all dimensions of sustainable development (economic, social and environmental) for the next fifteen (15) years. This Ministerial Meeting is the 11th Annual High Level Forum (HLF) which is being organised by the Caribbean Water and Wastewater Association (CWWA) and the Global Water Partnership-Caribbean (GWP-C) in collaboration with the Global Environment Facility – funded Caribbean Regional Fund for Wastewater Management (GEF CReW) Project. The 11th HLF which takes place under the theme “Connecting Water to Climate, Economic Growth and Development within the Post-2015 Development Agenda” forms part of the CWWA’s 24th Annual Conference and Exhibition which is being held in partnership with the Florida Section of the American Water Works Association (AWWA). The 11th HLF takes place at an appropriate time to allow for discussion and collaboration on water and climate matters to help shape the sustainable development agenda of the region. This year’s Forum is forward-looking with a goal of producing concrete outcomes and harmonised recommendations to guide national and regional efforts in operationalising water, wastewater and climate goals and targets for sustainable development. Some outcomes of the Forum are likely to feed into the contribution to be made by Caribbean Small Island Developing States (SIDS) at the 21st Conference of the Parties (COP) of the United Nations Framework Convention on Climate Change (UNFCCC) in December to play a pivotal part of global processes for advancing sustainable development. According to Dr. Douglas Slater, Assistant Secretary-General of Human and Social Development of the Caribbean Community (CARICOM), who will be a keynote speaker at the 11th HLF “Climate change will continue to have serious implications for water resources in the region,” linking the two critical issues. He has also stated that partnership remains one of the means of implementation needed to achieve sustainable water development goals. In addition to CARICOM and the Caribbean Ministers with responsibility for water and their senior government officials, representatives from regional and international agencies such as the United Nations Environment Programme Caribbean Environment Programme (UNEP-CEP), the Caribbean Water and Sewerage Association Inc. (CAWASA), the Caribbean Public Health Agency (CARPHA), the Caribbean Community Climate Change Centre (CCCCC), the Caribbean Institute for Meteorology and Hydrology (CIMH), the Caribbean Disaster Emergency Management Agency (CDEMA), the Pan America Health Organisation (PAHO), the Caribbean Development Bank (CDB), the Inter-American Development Bank (IDB) and the Food and Agriculture Organisation (FAO) are expected to attend. Professor John Agard who shared the Nobel Peace Prize with the United Nations’ International Panel on Climate Change, will moderate a Ministerial panel discussion at the Forum.